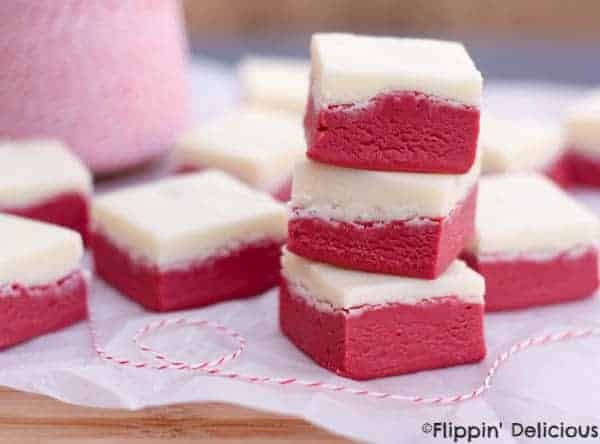 Easy red velvet fudge with a cream cheese frosting fudge layer is a decadent treat! Naturally gluten-free. For valentines day this past year I slaved away in the kitchen making gluten-free red velvet cake. It was my first valentines day as a married woman and I wanted to impress my husband. I was 7 months pregnant then, and we had an itty bitty kitchen in an itty bitty studio apartment. Despite my working conditions the cakes turned out beautifully. I was very proud of my work. That night, after our romantic fondue dinner, I discovered that my husband does not like cream cheese frosting. I just couldn’t understand why he didn’t love it, because I do. He was really sweet about it though, I don’t think he told me until after he had eaten half of his cake. Since then I have tried over and over to convert him to my love of cream cheese frosting. My attempts have only turned him away from it more. He liked this fudge, but he gave me the cream cheese frosting layer. If you are like my husband and believe that cream cheese only belongs on bagels, you can make it without the cream cheese frosting layer. If an 8×8 pan is too much fudge for you, the recipe can easily be halved and made in a loaf pan. If you are a red velvet fanatic, like me, don’t miss my gluten free red velvet cupcakes! It is one of my favorite recipes of all time. If you need a quick red velvet fix, you’ll love my gluten free red velvet mug cake. Moist cake is only ever 5 minutes away. 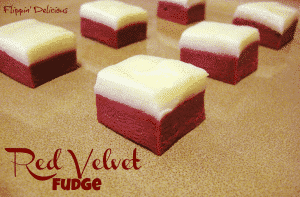 Red velvet fudge with a cream cheese frosting fudge layer. Naturally gluten-free! First, line a 8x8 pan with wax paper or aluminum foil, and then grease it lightly with butter. Pour 2 1/2 cups white chocolate chip, the milk chocolate chips and sweetened condensed milk into a microwave-safe bowl and microwave for 30 seconds. Stir, and microwave in 15 second increments, stirring in-between, until the chocolate chips are melted. Add the red food coloring starting with 1 teaspoon and adding more a little at a time until you get the color that you desire. Pour the fudge into your prepared pan, and place it in the fridge while you make the cream cheese frosting layer. Melt the remaining 1 1/2 cups of white chocolate chips in a microwave safe bowl. Start by microwaving them for 30 seconds, stirring them, and then microwave in 15 second increments, stirring in-between, until they are melted. Stir in the softened cream cheese. 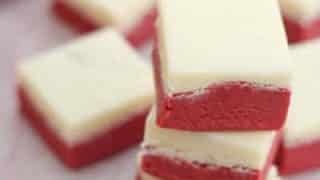 Pour the cream cheese frosting layer on top of your red velvet fudge and put in the fridge to chill until set. When you are ready to enjoy your fridge pull it out of the pan using the waxed paper/aluminum foil and place it on a cutting board. 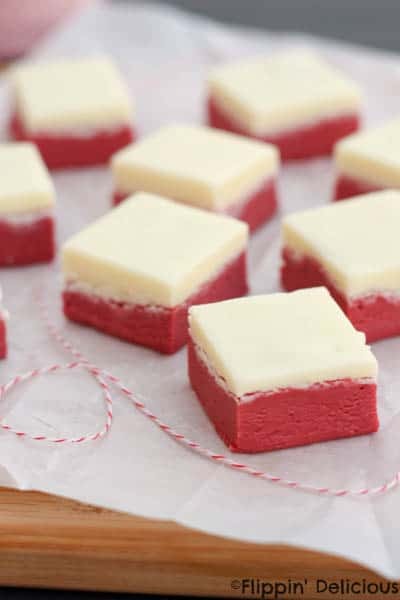 Cut the fudge into squares using a sharp knife. You'll get even cleaner cuts if you heat your knife blade up first by running hot water over it. Wipe your knife blade occasionally to keep the colors from rubbing into each other. so pretty! love the colors! Sounds so good. I love Red Velvet anything and of course, cream cheese frosting is a must!!! Will be trying this fudge over the holidays. Pinned. 🙂 Saw your link on I Heart Nap Time. I tried this recipe but sadly, it did not work for me 🙁 I used the 2 cups of white chocolate chips and a 1/2 cup of milk chocolate chips along with the condensed milk; however, it still resulted brown. Therefore, I could not dye it red. Any suggestions? The mixture will be brown before you add the red food coloring, but the coloring should still make the fudge red. Traditionally red velvet cake is light chocolate cake that is colored with food coloring (originally is was sweetened with beets and got its color from them.) I like the chocolate because I love the rich red color that it makes the final fudge. If you are worried about using too much coloring you could reduce or even omit the milk chococlate chips. If you omit them it won’t have the same red velvet flavor but will have a very bright color. Sorry I have taken so long to reply, the holidays have been crazy. Let me know if any of these suggestions work for you? Thanks for your feedback. So beautiful & they sound yummy!!! I don’t know whether it’s just me or if perhaps everybody else encountering issues with your blog. I haven’t had this problem, and I view my blog in all the different browsers (chrome, mozilla, explorer, and on my phone and tablet.) It might be just your browser. I just made this recipe today and flavor-wise it is amazing but I don’t know if I did something wrong or what…the texture is gummy rather than fudgy. Any idea what may have caused this? How do I print this recipe? Should be simple but I can’t figure it out. Thanks. No problem now. I did want to make a comment, however. Before I found your recipe I tried one from the current issue of Southern Living. It was a total flop! The ingredients were almost the same as yours except for lacking the sweetened condensed milk. It never did set up. Tastes delicious but you have to eat it with a spoon!!! I was wondering if you had heard anything else about this SL recipe. Their’s are usuallly very dependable. Thanks again. I’m looking forward to yours working out!! Thanks so much. I’ll let you know how it turns out. I did have one other question. Once it sets up, can it be stored at room temperature? I would suggest storing it in the fridge to prevent it getting soft. Also for food safety reasons, especially because of the cream cheese in the frosting fudge layer. I made the recipe. The first layer came out great. However, both attempts at the cream cheese layer did nto work. each time I added the cream cheese to the white chocolate, it came out clumpy and oily. Both times the cream cheese was softened so I’m not sure what the problem is. I guess we’ll just enjoy the one layer. Mary, I’m sorry that the cream cheese layer didn’t work. If the chocolate is too hot that can also make the oil in the cream cheese separate. If they are close in temperature it shouldn’t be as clumpy. Even if it does separate just drain off most of the separated oil and stir it vigorously until it comes together. Thanks Raia! Sorry, we had a busy weekend and I missed it. I’ll be there next week! I was curious as to how the color might turn out using less white chocolate chips and more milk chocolate chips in the base fudge? 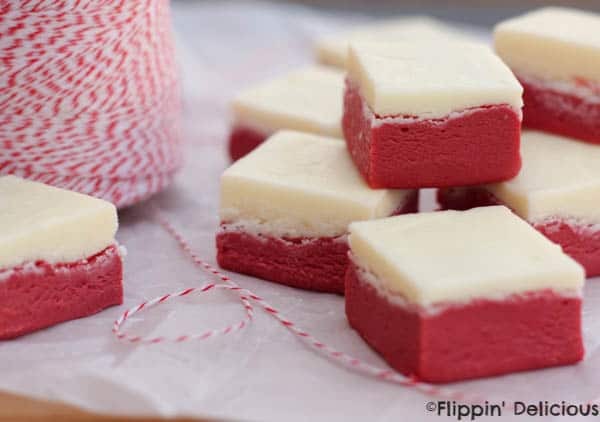 I want a nice red color but I’m not nuts about white chocolate and find that the sweetened condensed milk in fudge often makes it very sweet to start! Depending on how much you use, the color will be darker, and not as vibrant red. It could also be more of a brownish red. It depends on how much white chocolate you sub with milk chocolate. Let me know how much you use and how it turns out! I just made this today and I found it turned out awesome. Only next time I will double the cream cheese layer 🙂 thanks for your recipe! I’m glad that you liked it Jackie! Thanks for stopping by Flippin’ Delicious. after cutting how can you store it the fudge? You should be fine to store it up to one week. I’d store it in the fridge because of the cream cheese. Just let it come to room temp before serving. If you want to store it longer pop it in the freezer. Should be fine for a month or so in there. Loved the recipe but my fudge turned out really gummy the first time. When I melted the chocolate first it was fine. I added the colour and then the condensed milk, and success!! Can’t wait to eat it! I haven’t ever found unsweetened white chocolate or milk chocolate. I just used regular white chocolate and milk chocolate chips.